The Winnebago Trend class C motorhome brings a full feature motorhome to the market at an incredibly affordable price. Built on a Ram ProMaster chassis that boasts 280-hp. 3.6L V6 gas engine, 6-speed automatic 62TE transmission, and 220-amp. alternator. The Trend gives you the convenience, maneuverability, and comfort of a class C motorhome, yet still delivers unparalleled fuel efficiency. 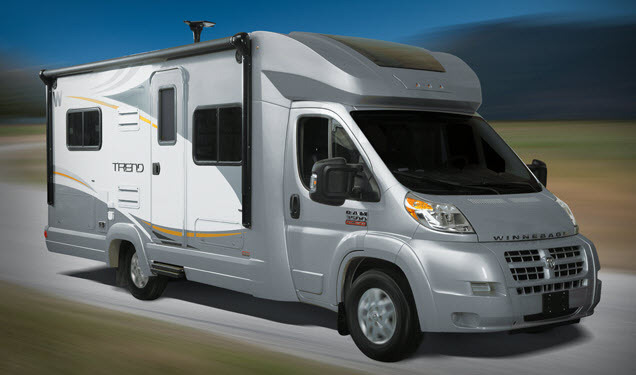 Trend motorhomes come with a ton of standard features you’d expect from a luxury motorhome. Each of these motorhomes can sleep up to 4 people, making them ideal for small families and couples traveling together. Read our Winnebago Trend review to learn more. The Flex Bed System allows you to easily convert your living area to a sleeping space that truly meets your needs. In some floorplans two twin beds will convert into a queen sized bed and in others the dinette will turn into a bed. Whatever your sleeping needs Flex bed will meet them with ease and convenience. Like most RVers you want to enjoy the great outdoors most of the time, but when it comes to sleeping or just getting some privacy you demand only the best. MCD Roller Shades allow you to control the lighting and privacy in your Trend and are easier to keep clean and maintain that traditional blinds. SmartSpace storage allows you to make the most out of every square inch of space in your motorhome. No space goes wasted in the Trend. 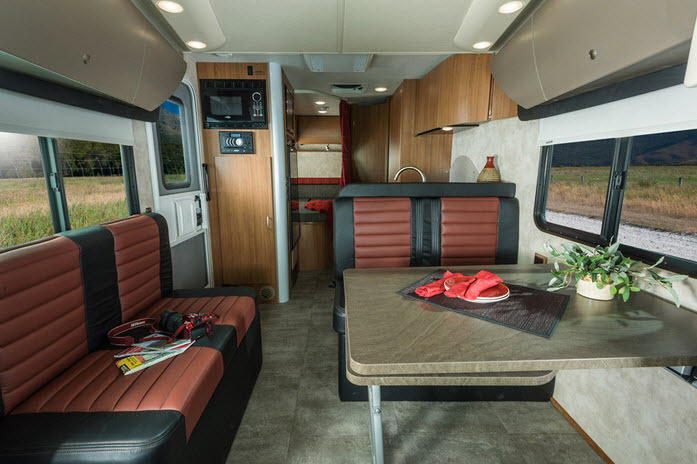 From the BenchMark full comfort dinette that features storage under the seats to the extendable sofa to pull out pantries you can rest confident that you’ll have enough space to pack all of your favorite things plus some! StudioLoft lets you make the cab of your motorhome a second bedroom! A large bed drops down from the ceiling to provide instant sleeping space, while curtains wrap around the bed to provide maximum privacy. This features provides the most accurate tank level readings possible thanks to Mirus Detector Cell technology. These create a micro-electric field that detects liquid levels from the exterior. This saves you from having to worry about clogs or corroding. If you’re interested in learning more about this incredible motorhome contact us or view our Winnebago Trend selection online. Our experienced team has served RVers since 1951 and is here to serve you. Mark Your Calendar for Our Annual RV Open House in Rural Hall! Don’t Miss Our Annual RV Open House! Don’t Miss Out on Our RV Fever Sale! Do You Have RV Fever? Bring it Down with Our Mega Sale!